Anna Maria Staśkiewicz is a laureate of the 3rd Prize and Special Prize for the best performance of Mozart’s Violin Concerto from the Polish Radio Competition at the 13th International Henryk Wieniawski Competition in Poznań (2006), the winner of the 5th International Karol Szymanowski Competition in Łódź and the 16th National Bach Competition in Zielona Góra, a winner of a special prize for the best performance of Mozart’s Violin Concerto at the 22nd Valsesia Musica International Competition in Italy. Anna Maria Staśkiewicz has performed concerts as a soloist in Poland and abroad, e.g. in Albania, Brazil, Bulgaria, China, Estonia, Georgia, Germany, Italy, Japan, Lithuania, Russia, Scotland, Slovakia, Switzerland, Sweden, Ukraine, Turkey and USA. She was invited to cooperate with Polish Radio National Symphonic Orchestra in Katowice, National Symphonic Orchestra in Warsaw, Sinfonia Varsovia Orchestra, “Amadeus” Polish Radio Chamber Orchestra, “Leopoldinum” Chamber Orchestra, Toruń Chamber Orchestra. Her other symphonic collaboration includes: Bydgoszcz, Lublin, Łódź, Zielona Góra and Poznań. She cooperated with: Sinfonietta Cracovia, Sinfonia Viva, The Presidential Symphony Orchestra in Ankara, Gottingen Symphonic Orchestra (Germany), Chamber Orchestra in Zurich, Sinfonica Municipal in Sao Paulo and others. As a soloist, she played under the baton of many distinguished conductors: Mirosław Jacek Błaszczyk, Łukasz Borowicz, Massimiliano Caldi, Agnieszka Duczmal, José Maria Florencio, Robert Kabara,Vladimir Kiradjiev, Jerzy Maksymiuk, Wojciech Michniewski, Marek Moś, Maxim Vengerov and others. As a soloist, she performed in many renowned concert halls; Municipal Theatre of Sao Paulo, Kaisersaal in Franfurt am Main, the National Philharmonic in Warsaw, the Raitt Recital Hall at Malibu, California, the W. Lutosławski S1Concert Studio of Polish Radio. Since 2011 she has been working as the violin assistant at the I.J. Paderewski Academy of Music in Poznań. She was awarded six times of the Minister’s of Culture and National Heritage Scholarship. She received a musical distinction and award from Kujawsko-Pomorskie Voivodship Marshall and the President of Toruń. She was granted the Artistic Scholarship from Poznań (2002) and "Młoda Polska" (Young Poland) scholarship given by the Minister of Culture and Arts (2007). Ania has a sense of beauty, a sense of style and a very good musical taste. She is intelligent and sensitive, so her interpretations, even of very well known music masterpieces, are thought over and thrilling. 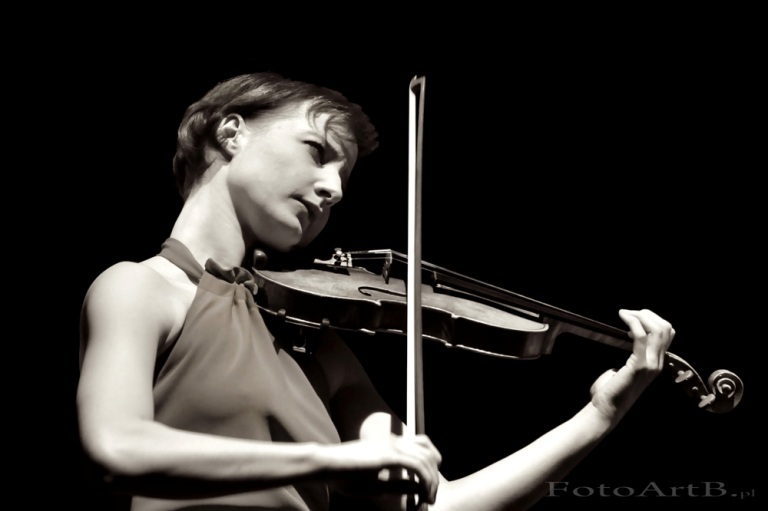 Anna Maria Staśkiewicz is one of the greatest talents in Polish violin playing. Her brilliant musicality, imagination and instrumental values allow me to speak about her absolute mastership, despite of her young age.